The Infinity harness/container system was designed with two basic concepts in mind: safety and performance. An emphasis has been placed on increased security of the pin cover flaps and riser covers, an additional main riser cover is incorporated into the reserve container side flap, a redesigned reserve pilot chute for better launch and higher drag, and the standard Reserve Static Line (RSL) is Velcro-free and concealed for maximum snag resistance. Main pin cover protection- Main pin and bridle protection are important in preventing out of sequence deployments and premature openings. The Infinity main pin flap does a great job of protecting both pin and bridle by anchoring the main pin flap and top main container flap at the same point. It's robust yet easy to use. You never need to put much worry that you may have knocked the pin cover open when climbing around inside or out of the aircraft. 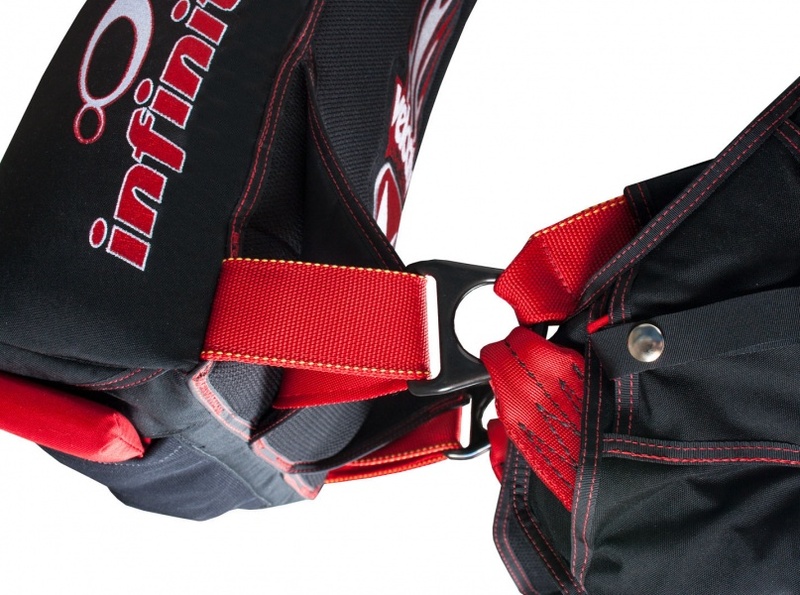 The Infinity™ is a great option for all skydiving and parachuting disciplines. Here are just a few that we cover (Accuracy and CRW not shown). State-of-the-art design for sport jumpers. The well thought out design of the Infinity rig is the baseline for the highest quality and performance standards in skydiving gear and equipment. We've taken the Infinity to the next level with wingsuit modifications. We offer dymanic corners (photo/description attached), a semi-stowless deployment bag aka the "Party Bag", and ring cover hook knife mounts. Everything about the Infinity harness container system is ideal for freeflying. Floating laterals- These have been called "the single most innovative improvement in harness design in a few decades" Along with the standard features of the Infinity rig comes chest articulation and freefly handles. To enhance our Swooper Rig, we met with some of the world's best canopy pilots and asked them what they'd like to see on equipment customized for their discipline. Learn more about the additional features available on our Swooper Rig here. Everything you could want in a student rig1 Static line, AFF hinged BOC, main ripcord, SOS system, adjustable leg pads, adjustable main lift web, #1 flap AAD window. Velocityrigs er leverandør av den kjente konteineren Infinity. Infinity er en konteiner som er utviklet for optimal bruker komfort, sikker i frittfall og med forsterkede klaffer.